The latest guide in our homeowner education series is here! Download “How to Communicate with Your Contractor during Construction” today! 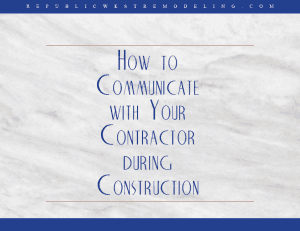 Republic West Remodeling’s new guide includes loads of tips for establishing good communication with your contractor throughout your project. We tell you how to keep the lines of communication open so you can get the end result you expect. The guide outlines some best practices for establishing and maintaining a meaningful dialogue throughout your project. Even if you’ve done everything right during the selection process, you could run into communication issues once construction begins. So, work with your contractor to ensure your communication styles mesh and lay the groundwork for a good system from the beginning. Construction isn’t an exact science, so chances are you’ll experience something unexpected at some point. When and if problems arise, you need to know you and your contractor will easily manage them. With clear channels of communication, you both should be able to easily handle anything the crops up. Don’t let poor communication stress you out, or worse, sink your project! Claim your copy of “How to Communicate with Your Contractor during Construction” now!